zumyn has produced a number of mosaics for use in print publications including Marie Claire and Red magazines. 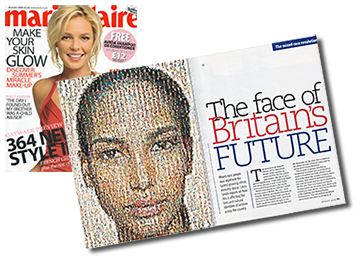 Marie Claire commissioned us to produce a mosaic as the full page lead for their article " The face of Britain's Future" featuring the faces of hundreds of different woman. Another popular area for corporate work is to produce large scale display mosaics to highlight events. 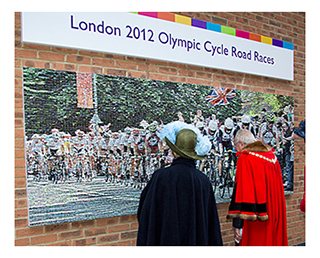 Two of the larger mosaics we have produced were both commissioned by Woking Borough Council. One to celebrate the London 2012 Olympics bike race being run through their borough, and the other to celebrate the Queen's jubilee celebrations also in 2012. Both mosaics were produced exclusively with photos of local residents taken at various related events across the summer and are on permanent display in Woking town centre. Mosaics can make very eye-catching pieces to promote events and competitions. 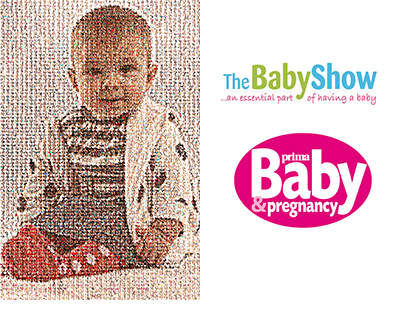 Promoters for The Baby Show at Earls Court contacted zumyn to produce a mosaic for them to promote their annual baby photo competition. The mosaic was made up of photos from the entrants in the previous year, and came together to produce a mosaic of the eventual winner. The piece was display on a giant banner at the Earls Court exhibition and used in promotional material. Numerous charities have contacted zumyn to work with them on campaigns they are running. One of these charities, Samaritan's Purse, run the Operation Christmas Child campaign that encourages people to donate a shoebox with a range of gifts in it. We worked with them to produce a mosaic of those donating their gifts, as well as an animated video of the mosaic building, that was used to promote their work to a wider audience. 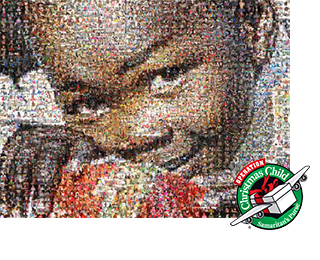 A number of schools around the world have produced mosaics to showcase photos of children at the school and their work. These mosaics are typically displayed around the school, with the option for parents to purchase copies for themselves. 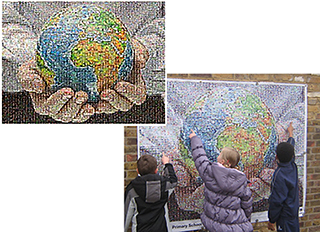 The example shown here was to promote environment week at a primary school and was displayed on a banner in the school playground.